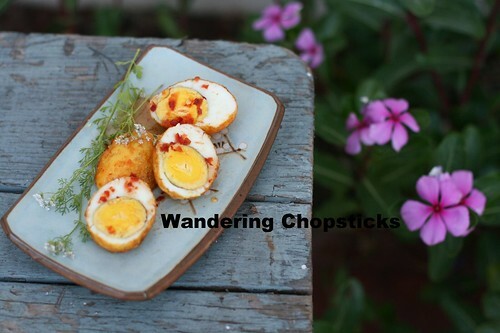 I was introduced to fried hard-boiled eggs when I made a Burmese Golden Egg Curry last year. 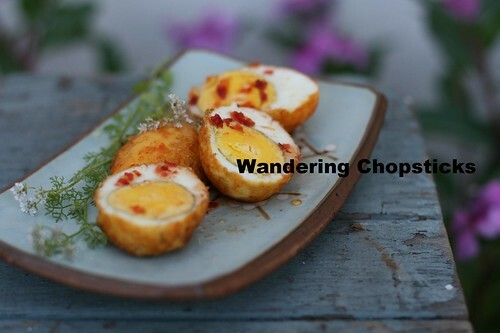 I knew about the general idea of deep frying hard-boiled eggs from a Thai Son-in-Law Eggs recipe in one of my cookbooks, but hadn't actually tried making it until that point. The Burmese egg curry was followed by Indonesian Fried Hard-Boiled Eggs Sambal that I ate at my neighbors' twins' birthday party, which prompted me to attempt an at-home version. Then came the Thai version with tamarind sauce and fried shallots. So I figured I should come up with a Vietnamese version. Nothing fussy. 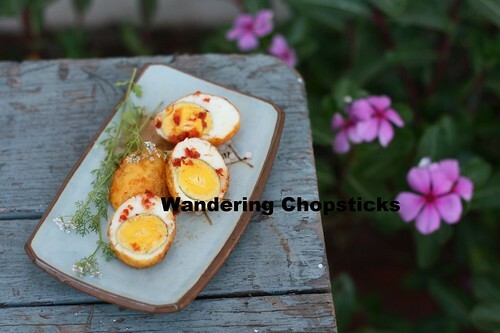 No curries or difficult sauces, just deep-fried hard-boiled eggs with chili fish dipping sauce. I did borrow the Burmese trick of adding some turmeric to the frying oil to turn the eggs this gorgeous golden color. 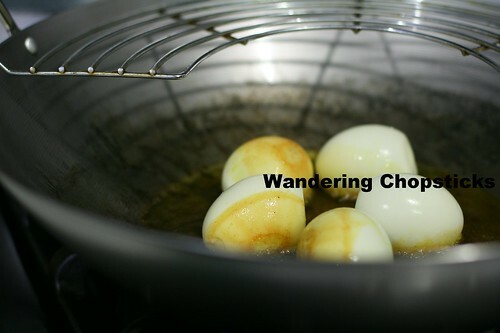 My trick for easy hard-boiled eggs is to put them in my electric steamer for about 12 minutes if I'm going to further cook with them, or 15 minutes if I want them harder-steamed to eat immediately. Seriously so easy. And if you're an egg fan like my brother's wife is, she couldn't resist asking if she could try a bite before I had finished making Hoanh Thanh Thit Heo Bam, Dau Hu, Hanh La (Vietnamese Wontons with Ground Pork, Tofu, and Green Onions) for dinner. As I said, I prefer to steam my eggs instead of hard-boiling them. Choose whichever method works best for you. Rinse the eggs in cold water and peel them. Set aside. 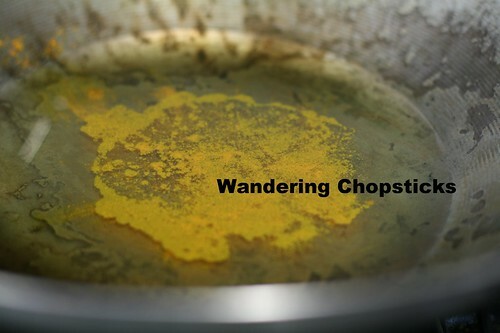 In a wok or frying pan, add about an inch of oil and turn the heat to medium-high. Add about 1/2 tsp turmeric powder to the oil. 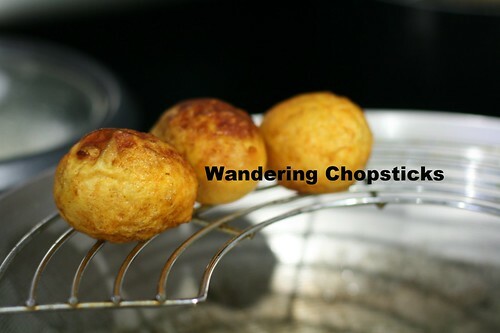 When the oil is hot, deep fry the eggs, turning so they crisp up evenly. When the eggs are all golden and blistered, drain and let cool. Meanwhile, make the sweetened fish dipping sauce if you don't have any on hand. Cut the eggs in half, plate, and drizzle the fish sauce over the eggs. P.S. The blog hit 9 million visitors today! 1 year ago today, Sam Woo Crisp Fish Skin Laver Flavour. 4 years ago today, Zuppa Toscana (Italian Tuscan Soup) alla Olive Garden. 5 years ago today, One Sunset - West Hollywood (Closed). 6 years ago today, Tri-Colored Roasted Carrots. 7 years ago today, Shanghainese food at Mei Long Village - San Gabriel. Love love love eggs. But have surely never tried frying hard-cooked eggs! The turmeric trick is pretty cool. 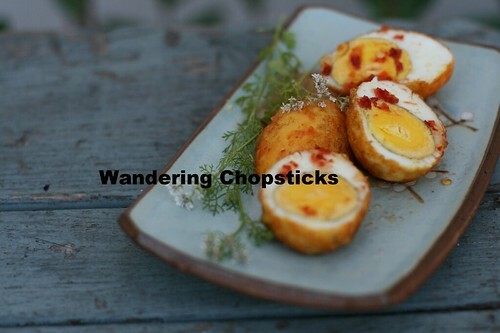 Well, just wait til I blog the three other fried hard-boiled egg recipes! The crispy texture of the whites when the eggs get fried is awesome. My sister-in-law asks every time if I coat them in flour or do anything special, but they're just deep-fried hard-boiled eggs. Thank you for this! I needed something easy today! I'm indebted to your blog. Like really. Aww, that's so sweet. Thank you!